Today’s haul. All of these are great edibles! Most of these species have gills, which generally have dangerous look-alikes…so remember, these are not for beginners. So what we have here, counter-clockwise, starting from one seriously gigantic Oyster Mushroom, are the following species: Entoloma abortivum (the actual mushrooms, not “aborted” ones); Blewits (Lepista nuda); two rather large Brick Tops (Hypholoma sublateritium); a ton of Alcohol Inkies (Coprinopsis atramentarius); some smaller Oysters (Pleurotus ostreatus); more Entoloma abortivum; a pile of yellow-gilled Man on Horseback/Tricholoma flavovirens; a couple of older Alcohol Inkies with stems not removed; a big Horse Mushroom (Agaricus arvensis), related to Portobellos but with a hint of sweetness; on the right of the big Oyster where we started, some Jelly Tooth (Pseudohydnum gelatinosum), well loved by the two of us. And finally, in the bottom right corner of the cutting board, some Graylings (Cantharellula umbonata). What to cook first? We’ve never had so much Alcohol Inky to work with before, so we’re gonna make David Arora’s “inky cap and salami sandwiches”. 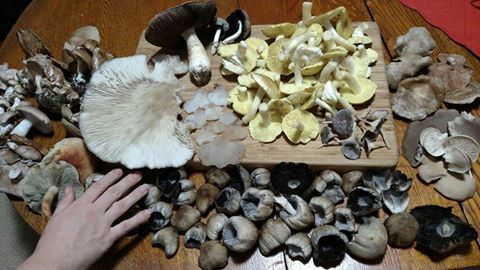 Awesome…who knew New England mushroom hunting could be so good in November?